Above all, I remember his laughter and the mischievous twinkle in his eye. He would say something uniquely insightful, and immediately cover it up with a chuckle. Only later would one realize the depth of his learning, as layers upon layers of wisdom emerged from a casual conversation in the hallway. H. Patrick Glenn (bio; guestbook), the Peter M. Laing Professor of Law, passed away on October 1, 2014. He was 74 years old. ADDENDUM: The Faculty is organizing a memorial reception on November 21 for Professor H. Patrick Glenn. The University Flag will be lowered that day in his memory. Professor Glenn and his wife Jane Matthews Glenn came to McGill University in 1971, part of a group of young scholars recruited by the Faculty of Law to bring to life the new National Program established three years earlier. Originally from Toronto and a member of the Bar of British Columbia, H. Patrick Glenn already embodied the cosmopolitan spirit that still characterizes McGill: he had studied law at Queen’s University and Harvard Law School before completing a doctorate in law at Strasbourg. Professor Glenn spoke flawless French and immersed himself in the academic and legal community of the province of Quebec, where he made lasting friendships. He learned Italian, Spanish and German by listening to language tapes as he walked to work every day, and delivered keynote addresses at learned conferences around the world, a distinguished ambassador for McGill wherever he went. A world traveler, he always returned to his beloved country home in Sutton, where he and Jane established roots and welcomed colleagues, students and scholars from around the world. From the earliest days of his career, Professor Glenn’ scholarship pushed the boundaries and revisited the foundations of comparative law. He quickly became one of the world’s most respected authorities in private international law and comparative civil procedure. His most significant scholarly contributions on the theory of comparative law were to come as he reached middle age. Beginning with a landmark article in the late 1980s, Professor Glenn laid the foundation for a deep understanding of legal traditions from a rich historical and comparative perspective. In contrast to scholars who emphasized differences and incommensurability between national legal traditions, Glenn claimed that law had been, throughout history, the product of a rich dialogue between local legal forms. For him, all legal systems were dialogic, dynamic and interactive. He imagined the reconciliation of laws as a means to the reconciliation of peoples. By the mid-2000s, Patrick Glenn had published a handful of monographs on comparative law, each of which was widely acknowledged as a canon that redefined the field. His Legal Traditions of the World: Sustainable Diversity in Law, now in its fifth edition, was a global success. This work was awarded the Grand Prize (Canada Prize) by the International Academy of Comparative Law in 1998. It is, by all accounts, the definitive book on the meaning, scope, past and future of legal traditions. It could not have been written by anyone else. H. Patrick Glenn’s voice was unique – informed by the broad culture and originality of an unconventional renaissance man. Glenn was a curious, voracious reader, and absorbed knowledge and ideas from wherever they came. His office was a complex maze of books – on shelves, on chairs, in shaky piles on the floor and on his desk. He weaved together images from law, art, science, history, literature, anthropology, behavioral psychology, and mathematics into a kaleidoscopic account of modern legal cultures. His scholarly achievements were nothing short of prodigious – a dozen books and over 200 scholarly articles in several languages – earning him the universal respect and recognition of the global community of comparative law scholars and students. At the time of his passing, more than four decades after his auspicious beginnings at McGill, H. Patrick Glenn was not retired. He had just put the finishing touch to a compelling and iconoclastic monograph, La conciliation des lois, drawn from a celebrated series of lectures delivered as a “cours général” in the Hague Academy of International Law. He was still planning to teach and write for another few years. He looked exactly the same as he did in the early 1970s: a distinctive head of white hair, a thick white beard, a playful smile. H. Patrick Glenn did not inspire reverence – he was too modest, too unpretentious as a man and as a scholar to inspire anything but affection and admiration. Nonetheless, his career is marked by a succession of awards and distinctions. Professor Glenn was a visiting Fellow at All Souls College, Oxford, and held the Henry G. Schermers Fellowship at the Hague Institute for Internationalization of Law and Netherlands Institute of Advanced Studies. He was a visiting scholar at the Max Planck Institute in Hamburg, and an elected member of the International Academy of Comparative Law. In 2002, he received an honorary doctorate from the University of Fribourg in Switzerland. Within Canada, Professor Glenn also received a Bora Laskin National Fellowship in Human Rights Law, as well as a Killam Research Fellowship. In 2006, he received the Prix du Québec (Prix Léon-Gérin for the social sciences and humanities), the highest distinction conferred by the Québec Government in recognition of his outstanding contribution to scholarship in the social sciences. A fellow of the Royal Society of Canada, Professor Glenn was, at the time of his death, the President of the American Society of Comparative Law, the first scholar from outside the USA to hold this prestigious position. 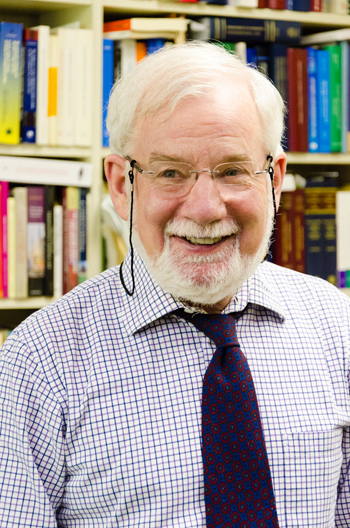 Few scholars in law and social sciences have had a more decisive influence on the development of their discipline as Professor Glenn has had in comparative law and legal theory. Few have had a more lasting impact on their students, colleagues and institution. Yet, today, it is the friendship, grace and wit of this extraordinary man that we miss the most. At McGill’s Faculty of Law today, it feels like another one of the biggest trees in the forest has just been felled – this one without warning. Our thoughts are with our dearest colleague Jane Matthews Glenn, and their children Shannon and Jeremy.